Martha's Vineyard is a well known summer vacation spot. In this collection of columns, former Martha's Vineyard Times editor Nelson Sigelman describes an island preoccupation, less notorious than tourism but more obsessive, rooted in fishing, hunting and waterfowling traditions that shaped the island's character well before a mechanical shark named Bruce and presidents Bill Clinton and Barack Obama attracted slavish media attention to a 100-square mile speck off the coast of Massachusetts.Martha's Vineyard Outdoors casts a wide net. 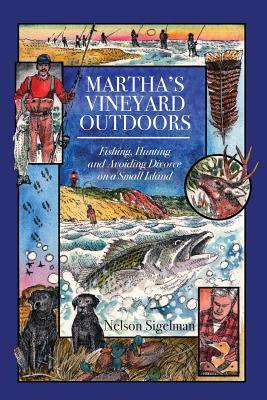 "The pleasures of Nelson Sigelman's distinctive voice held this non-fishing, non-hunting, feminist, tree-hugging pinko spellbound from the first column to the very last," said Island resident and Pulitzer Prize winning author Geraldine Brooks.The setting is Martha's Vineyard but the stories are rooted in the humor and love of the outdoors found in small communities across the country. Nelson Sigelman worked for 27 years at The Martha's Vineyard Times where he was a reporter, later news editor, and from 2014 to October 2016, editor of the award winning weekly newspaper. For 26 years he wrote a popular weekly fishing column and occasional hunting column. He has been honored by the Outdoor Writers Association of America and the New England Outdoor Writers Association for his column writing and he is a member of the prestigious Martha's Vineyard Striped Bass and Bluefish Derby Hall of Fame. Nelson lives with his wife Norma in Vineyard Haven. For more information go to marthasvineyardoutdoors.com.